The most common question forefoot running learners ask is where is your forefoot? This is a good question because many runners believe that in forefoot running, the toes are the forefoot. As a consequence, many runners make the mistake of toe-striking when forefoot running. The forefoot is the balls of the foot, just under the toes. In forefoot running, the FIRST part of the foot to contact the ground is the ball of the foot, followed by the lowering of the heel to the ground. The opposite foot strike to forefoot running is heel strike running where the heel is the first part of the foot to contact the ground and the forefoot makes ground contact last. To eliminate braking, impact transients, and minimize the ground reaction force, the forefoot must be the first part of the foot to contact the ground while running. If the heel contacts the ground first, shock attenuation, joint loads and torque as well as tibia acceleration increases. 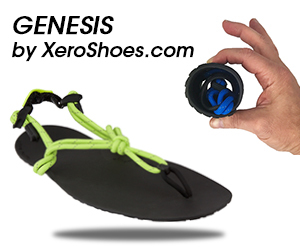 What Part of the Forefoot Contacts the Ground First When Forefoot Running? In forefoot running, the first part of the forefoot to contact the ground is closer to the outside of the forefoot (under the 4th and 5th metatarsal head, shown below. This is how habitual barefoot runners and most elite runners strike the ground with the forefoot. 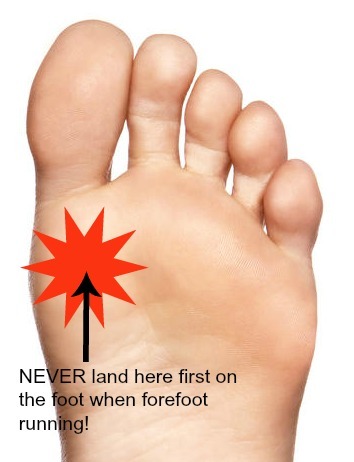 One of the biggest mistakes forefoot running learners make is landing first on the MTP region. The MTP area (under the 1st and 2nd toe) is not anatomically stable to withstand discrete vertical plantar stress at touchdown. Experts once assumed that due to its large diameter and load bearing surface, the 1st metatarsal head would be strong enough to absorb impact at foot strike. However, this is not the case as previous reports have found that increased plantar stress at touchdown on the MTP resulted in unfavorable joint remodelling. Landing first on the MTP area also results in a greater ankle plantar flexion angle compared with landing first on the outside of the forefoot which involves a flatter foot placement and a small plantar flexion ankle. A high ankle plantar flexion angle at touchdown increases toe strain and bending moments on the 1st and 2nd metatarsal heads. 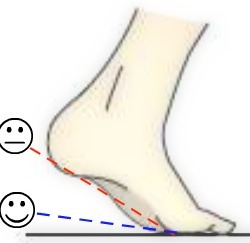 Red dashed line: landing high up on the MTP joint results in a higher ankle plantar flexion angle which increases risk of a metatarsal stress fracture. Blue dashed line: landing first on the lateral edge of the forefoot results in a smaller ankle plantar flexion angle. 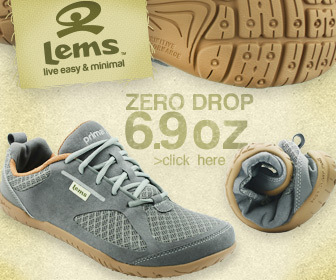 The lateral forefoot has better bone geometry capable of dissipating plantar loads. 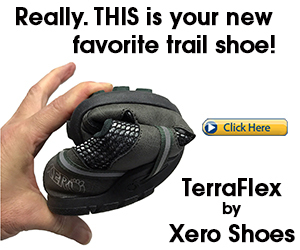 The forefoot is the balls of the foot, not the toes. 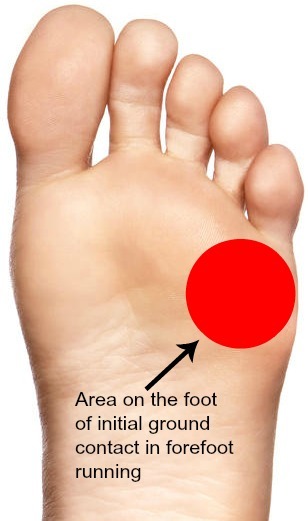 However in forefoot running, although the forefoot is the first part of the foot to touch the ground, it is important to remember that the lateral aspect of the forefoot contacts the ground first, not directly under the big toe. Gross, TD and Bunch, RP. A mechanical model for metatarsal stress fracture during distance running. Amer J Sports Med, 1987; 17(5):669-674.